18-04-2017, 13:35 - Inherited an MSX with interesting tapes... wat do? 15-04-2017, 11:54 - My Toshiba HX-10 gets mighty hot! 01-04-2017, 12:38 - Back to the MSX after 32 years! 31-03-2017, 12:52 - Back to the MSX after 32 years! 20-08-2016, 12:40 - SVI-838 System disk? 07-07-2016, 12:28 - Attempting to digitize a cassette game, advice? 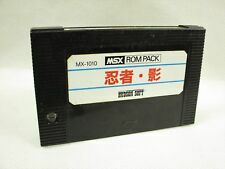 17-06-2016, 13:01 - Introducing/what MSX do you use as your main machine today?